Our research looks to understand the genetic and epigenetic mechanisms underlying two neurodevelopmental disorders caused by genetic dosage imbalance of the 7q11.23 locus (hemideletion Williams-Beuren Syndrome, WBS and hemiduplication, 7dupASD), which display a paradigmatic contrast of socio-cognitive features while sharing intellectual disability. 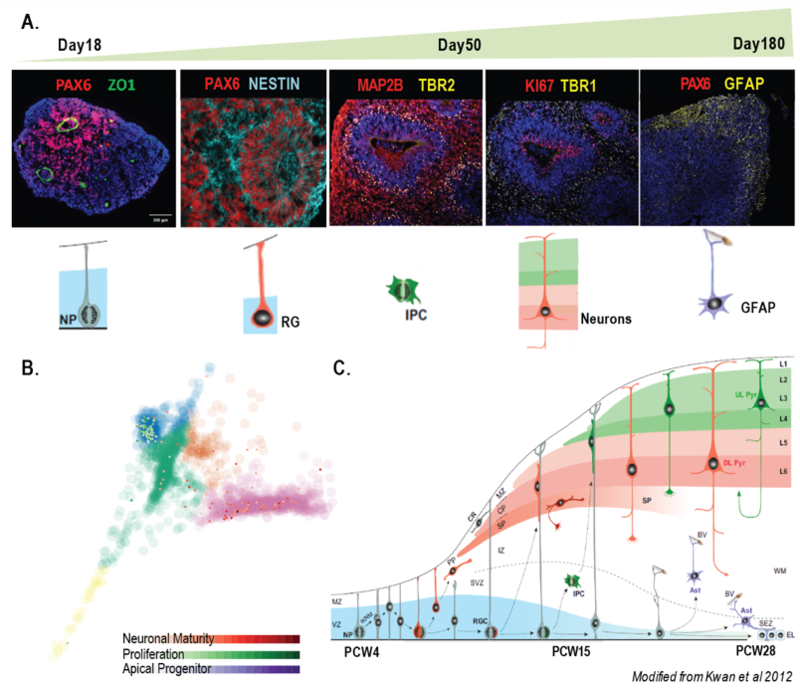 We are addressing this challenge by harnessing the largest cohort of human induced pluripotent stem cells (iPSC) characterized thus far these syndromes and differentiating them into relevant lineages: First, an optimized version of the fast induction of functional glutamatergic neurons by the induced expression of neurogenin-2 (NGN2), which allows us to identify morphological, transcriptomic and electrophysiological signatures inherent to mature neurons. Second, we differentiate patterned neocortical spheroids, which allow us to recapitulate different stages of early human brain development, including cell populations unique to the human brain in a 3-dimensional structure, thus gaining cellular and molecular insights with a higher physiological accuracy than similar alternatives. Third a small molecule-driven approach to generate neural crest cells. We investigate the impact of the gene dosage imbalance by means of several "omics" approaches at a bulk and single cell levels, as well high throughput imaging and functional assays from representative pools of progenitor and mature cells. We combine in vitro patients’ derived cellular models such as induced pluripotent stem cells (iPSC) as well as their neuronal derivatives (cortical glutamatergic neurons) with advanced in vivo models to understand the molecular underpinnings of neurodevelopmental disorders. Clinical and animal studies have revealed the critical roles that transcription factors GTF2I and BAZ1B play in the cognitive-behavioral profiles of Williams-Beuren (WBS) and 7q.23 microduplication including ASD, (7DupASD) syndromes through transcriptional regulation of their target genes. To identify the target genes and to understand the molecular pathways that they regulate we differentiate iPSC towards neuronal lineages that are the most affected cell populations. In particular, we generate cortical glutamatergic neurons in a very short time either by overexpression of pro-neuronal factor neurogenin 2 (Ngn2) with lentiviral and piggy bac system or by driving neuronal differentiation with small molecules. Previously, using in vitro cellular models, we showed that GTF2I associate with lysine demethylase 1 (LSD1) to transcriptionally repress key genes involved in intellectual disability, autism and neuronal function that could be rescued by inhibition of LSD1. Consequently, we want to validate the use of novel LSD1 inhibitors in rescuing transcriptional repression and ameliorating cognitive-behavioural deficits (i.e. sociability/communication and repetitive behaviors) in physiopathologically relevant ASD in vivo models that accurately mimic GTF2I CNV, as a prerequisite to advance the most effective LSD1 inhibitor towards pre-clinical development. In my PhD project I specifically investigated the role of a transcriptional regulator/chromatin remodeler (i.e., BAZ1B) in the definition of neural crest-related phenotypes in Williams Beuren (WBS) and 7q11.23 microduplication (7dup) syndromes, caused by the hemideletion or hemiduplication of 28 genes at the 7q11.23 region. 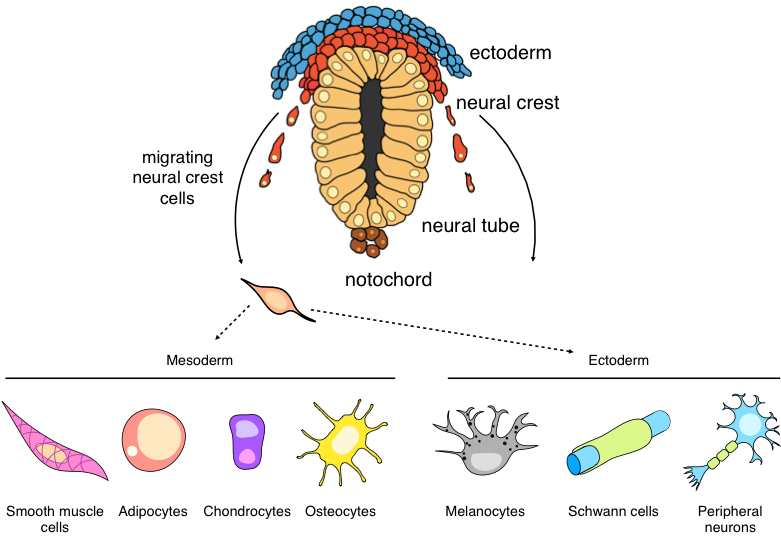 The Neural Crest is a transient and multipotent cell population that originates during gastrulation and gives rise to a large variety of cell types, including adipocytes, osteocytes and chondrocytes, which composed craniofacial structures, SMCs in the vessels, melanocytes, and Schwann cells and sensory neurons of the peripheral nervous system. BAZ1B, is indeed a prime candidate to study disease-associated craniofacial alterations, because of its critical role in the migration of neural crest stem cells (NCSCs) in Xenopus and in the acquisition of craniofacial defects in mice lacking this protein. Intriguingly, WBS patients bearing a partial deletion of the region that spares few genes, including BAZ1B, display much milder craniofacial dysmorphisms, further pointing to its involvement in this specific phenotype. In order to define the BAZ1B-dependent alterations responsible for craniofacial dysmorphisms in the two conditions, I integrated transcriptomic analysis with enhancer profiling, given the critical role of their regulatory architecture in NCSC development and function.